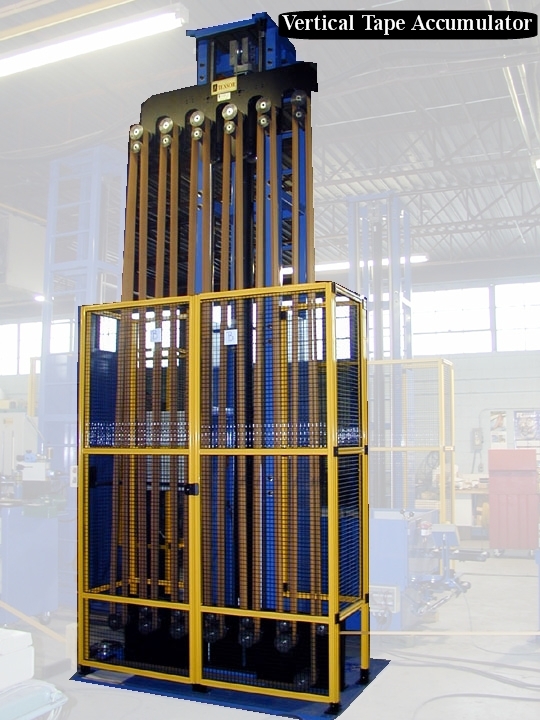 Accumulator - Vertical Festooning | Tensor Machinery Ltd. 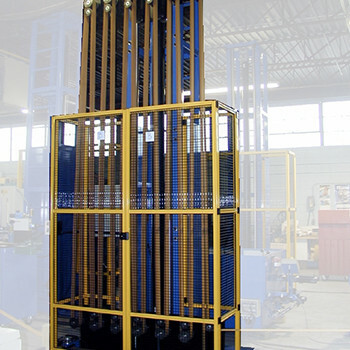 The Vertical Festooning Accumulator is designed to accumulate either smooth or corrugated metal tape—but is typically used with smooth tape. The accumulator unit has a series of rollers by which metal tape is passed from one roller to the next. The accumulator stores approximately 100 meters of tape during normal operation. The accumulator is normally positioned directly after the tape pay-off when smooth tape is being accumulated. When a tape splice is required, the pay-off stops and a clamp at the entrance to the accumulator holds the tape while the splice is being performed. The accumulator carriage slowly collapses supplying tape to the line under constant tension. When the tape splice is complete, the pay-off is started and the clamp opens. The accumulator carriage is then extended to refill with tape. Either an air cylinder or a torque motor is used to control the position of the moving carriage and the corresponding tape tension. Threading up of the accumulator is an air cylinder or a torque motor used to control the position of the moving carriage and the corresponding tape tension. Threading up of the accumulator is fast and simple. For the initial thread up, the traversing roller carriage is retracted past the fixed rollers. The tape is then fed between these rollers. The traversing roller carriage is then extended, and the tape is accumulated between the fixed rollers and the rollers on the traversing carriage. A PLC is used to control the accumulator and synchronize it with the line.